Severe Features/Storytime Films/Vendetta - 92 min. Costume Designer: Kylie Cooke; Makeup Designer: Deb Watson; Art Direction: Jane Bucknell; Choreographer: Parris Goebel; Producers: Leanne Saunders, Daniel Story, Jill Macnab; Director: Tammy Davis. 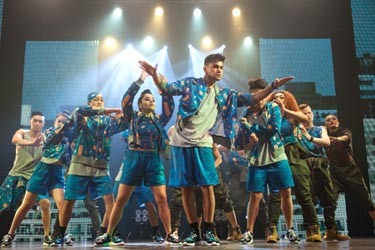 Tu Kaea has the chance to audition for K-Crew, the best hip hop crew in the country, but he has to go behind the backs of his home crew and best friend. Things get even more complicated when he starts falling for the girlfriend of K-Crew's leader. Caught between who he is and who he wants to be, Tu must find the strength to make his own breaks. Starting 30 March 2016, a PAL R0 DVD can be purchased from NZ sources for about $30nz. The jacket slick says the feature is presented in a 1.85:1 format (but I measured 2.33:1), 16x9 enhanced, with a DD Surround 5.1 English language track. There are optional English subtitles. On the same date, it is released on 1080p All Regions, (although the box slick incorrectly says it is Region B) Blu-ray with DTS-HD MA 5.1 spoken English and optional English subtitles. It is also selling for about $30nz. Special features include: Stan Walker music video, featuring Samantha Jade, 'Start Again'(3:51); Cast and Crew screening(4:15); Featurette (1:55); teaser trailer (0:58); theatrical trailer (2:01). The extras are all presented 1080i with DD 2.0 English, but they do not have subtitle options. It became available from Australian sources starting 01 April 2016 with the R0 DVD at $25-30au and Region B Blu-ray at $30-35au.